Woohooo!!! Sun Microsystems have beaten all expectations and posted a profit for their 3rd successive quarter, and posted their first annual profit since 2001. See how the share price took a dive in the first part of the day. 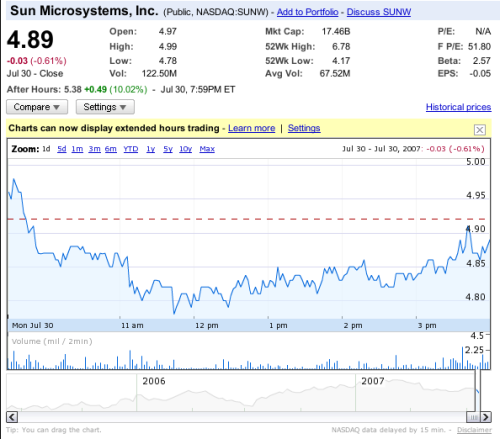 Then of course, Sun announced profits, outside of trading hours and check the jump in price. A jump of 49c!!! Lets hope this change in the tide for Sun is a long term one, and lets hope those pessimistic investors wake up and realise Sun IS a good investment. Watch Sun this year. I'm anticipating some exciting times in the world of computing, especially with "Niagara 2" on it's way. This processor will rock the world and give Moore's Law one hell of a kicking.